Comment	 CG4 (also known as The Hand of God) is a cometary globule that lies about 1,300 light-years away from Earth in the southern constellation of Puppis (the Stern). Its 'head' is some 1.5 light-years across, and its 'tail' is about eight light-years long. This dusty, star-forming region contains enough gas and dust to form several stars about the size of the Sun. Cometary globules are isolated, relatively small clouds of gas and dust within the Milky Way, formed by the interplay of cold molecular clouds and hot stars. They are typically characterized by dusty heads and elongated tails, what make them look like comets, although they are very much different. These globules are frequently the birthplaces of (low mass) stars, and many show very young stars in their heads. Intense stellar winds from the stars evaporate gas and dust away from the head forming the tail and completing the cometary shape. An annotated image produced by Sakib Rasool is available here for reference. Thanks Sakib. This image is a [Ha+R]GB four panel mosaic. 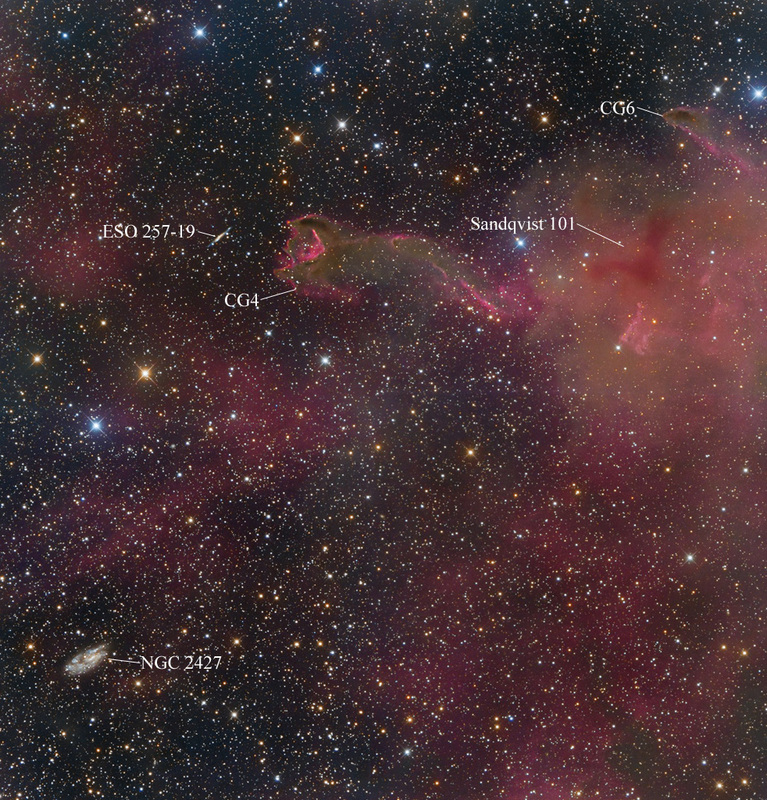 APOD - CG4: A Ruptured Cometary Globule, 13th May 2014.